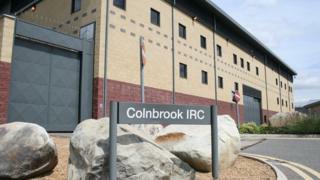 Inspectors found one prisoner at Colnbrook IRC downloading "inappropriate content" in an internet room, as they carried out their checks. The Home Office said it was working with Mitie - the company that manages Colnbrook - to ensure all prisoners were adequately supervised. The report said: "No other measures were taken to supervise these detainees, one of whom was subsequently found downloading inappropriate content in the internet room. "He was banned from further use of the facility, but no further restrictions were placed on him. "He was transferred to prison some days later, when an allegation was made that he was grooming another detainee." HMIP found there had been a "very significant increase" in self-harm at the facility, while staff and detainees told inspectors the availability of drugs was a problem. HMIP examined 12 cases in detail and concluded that in five the Home Office had "failed to act diligently or expeditiously". In reaction to the report a Home Office spokesman said: "We have always been clear that we expect the highest standards from detainee custody officers and others who work with detainees. "We are working closely with Mitie to make sure that all high-risk detainees are properly supervised at all times."